In Android Marshmallow you can easily sort the items or icons that are present in the quick settings panel. To move the setting items like Wi-Fi, screen brightness, and others, there is an experimental but a working feature called System UI Tuner. It allows us to make some changes to the user interface and changing the order of items that appear in the quick setting dropdown is one of the features. So, first and foremost, you will have to unlock System UI Tuner in the Android Settings. Once unlocked, you can access it and make changes to the tiles that are shown in Quick Settings. You can easily drag around the items to change their order. You can also add new tiles and even remove the ones that you don’t want it there. It is all about configuring the details so you get what you want when you use two fingers to pull or pull down twice the Android status bar. Pull the navigation drawer twice or use your two fingers to pull it down once. Click on the gear icon for a while till it begins spinning and let go. You will get a confirmation that System UI Tuner has been added to the Android Settings. Get more details and screenshots about activating it here. Go to Android Settings or the main settings area of your device. Scroll to the absolute bottom and tap on System UI Tuner. To Move Tiles: Press and drag it to a new location and they will be re-ordered. 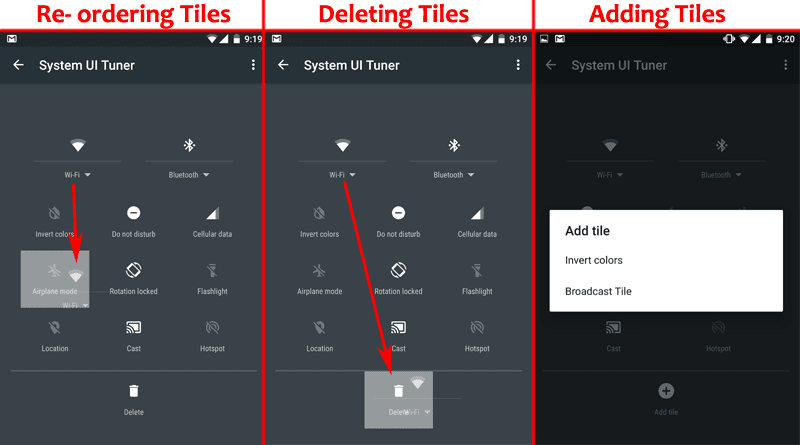 To Remove Tiles: Press and drag it to the delete or trashcan icon. To Add Tiles: Click on Add tile, select the one that hasn’t been added and it will get its place. All the changes that you make will be saved instantly. You can make additional changes and to revert it to the original state, you can either drag the tiles back or you can disable the System UI Tuner by using its option menu.